Since Francis Field reopened on March 17, the DC Department of Parks and Recreation (DPR) has issued permits for more than 300 hours of use for the Spring 2018 season, which runs until June 17. This includes several new users, which are large "social sports" leagues. The field has been heavily permitted for "kick-ball" games on weekends. This includes four hours of time every Sunday between March 18 and May 20; and five hours of time every Saturday between April 14 and June 9. 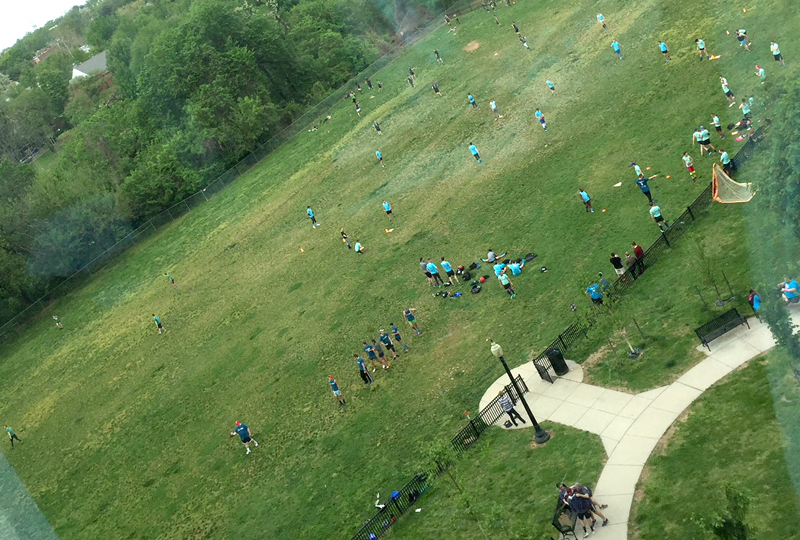 Shown in the photograph below, taken on Saturday, May 5 from a resident's window, is one of these kick-ball leagues. More than 70 people can be counted on the field, and the photograph does not show the entire group. These leagues conduct multiple games, played simultaneously, on different sections of the field. Most of the players wear cleated shoes. In addition to the kick-ball leagues, a Frisbee group of about 30 players has the field permitted every Saturday morning between March 17 and June 16. Other leagues have permitted the field on weekday evenings. FFF is also concerned that the amount of permitted play is inconsistent with the maintenance of the field surface provided by the District government. Under the present structure, DPR issues permits for the use of the field, but a different District entity, the Department of General Services (DGS) issues and enforces maintenance contract for replanting grass, fertilization, aeration and other landscaping care. As discussed on this website, over-use and under-maintenance in the past has resulted in a bare-dirt field, which is unsafe and unsuitable for youth sports. (See the Neglect article. FFF is currently attempting to work with both the DPR permitting office and the DGS maintenance contractors to find a balance that will provide a neighborhood asset rather than a nuisance. 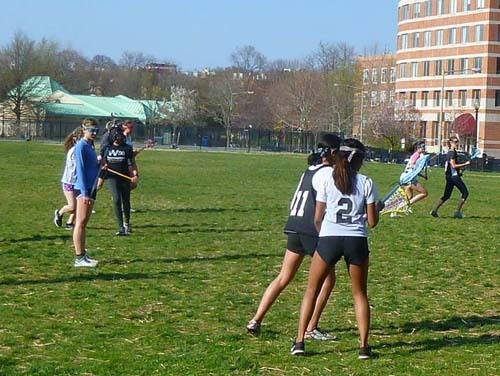 While many of the District's public schools have their own athletic fields, the two public schools in Foggy Bottom and the West End do not have dedicated school fields. These are the School Without Walls, a high school in Foggy Bottom, and the former Francis Junior High School, which now includes pre-kindergarten through 8th grade students and is known as the School Without Walls at Francis Stevens. School Without Walls has permitted the field from 4 pm to 6 pm on 55 weekdays between March 19 and June 1. Making the field safe—and keeping it safe—for such public school use is one of the priorities of FFF's "green field" initiative. 01. District of Columbia Department of Parks and Recreation, Permit Conditions, Policies and Procedures Accessed May 23, 2018. Web link, PDF. Copyright 2018, Friends of Francis Field.